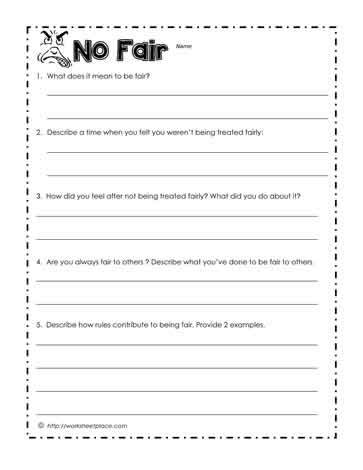 This worksheet focuses on what it means to be fair. All to often children don't understand what fairness means. Being predictable and honest helps to develop fairness. When a child yells, that's no fair, take the time to discuss what happened, why it happened and what could be done about it. Sometimes a promise to go on a school trip but needing to cancel due to bad weather gets the response of no fair. However, it's just bad timing or bad luck. Present these types of opportunities to help children understand fairness.